2005 YU55 will be making its closest approach to Earth in just ten days, and excitement is really beginning to build about this event - basically a free flyby except that the entire Earth gets to fly by it instead of just a probe. 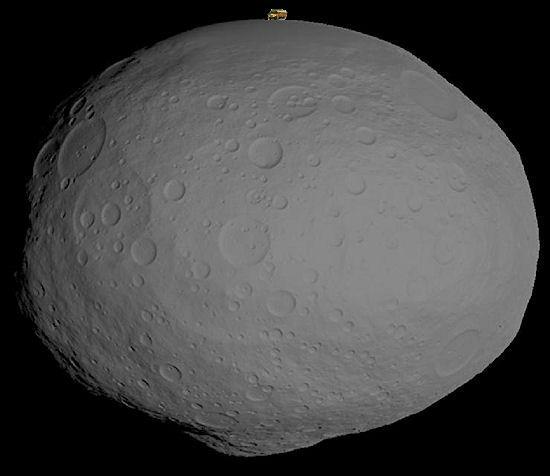 As I often do, I would like to give an idea of exactly how big this asteroid is. It's about 400 metres in diameter, and round. So let's take an image of a fictional asteroid...and put a bus on it. Going with the bus is because it's far too large to be able to properly visualize a human on the surface - a human ends up being something in between one and two pixels in length. Note in particular its slow rotation (18 hours). Refinements to what we know of its orbit will continue to be made in the days leading up to the flyby as at closest approach it will be moving quite fast. Also quite interesting is that while 2005 YU55 will fly by us at 0.85 lunar distances, it will fly by the moon itself at a somewhat closer 0.62 lunar distances; if we had people on the moon at present they would be able to contribute to our observations of the asteroid as well.